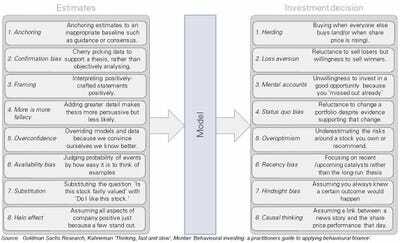 Look around the investing world and biases are pervasive, from clustering estimates around company guidance (anchoring) to avoiding a stock that has already outperformed (mental accounts). 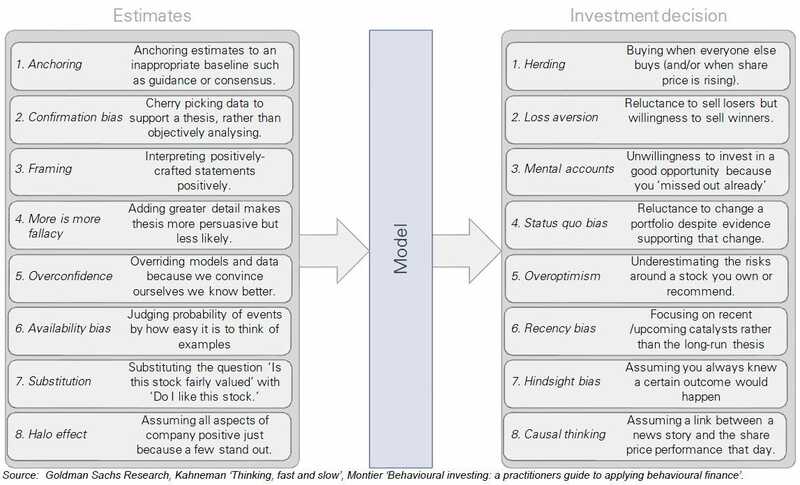 And these biases make a difference.Biases creep into the investment process at two important stages. Second, biases find their way into the investment decision. Even a bias-free upside calculation may be ignored and over-ridden when the share price is falling (herding with other fearful investors) or the company has been subject to a recent negative press story (recency bias, availability bias). Stocks may be held rather than sold because they’re in negative territory (loss aversion), the evidence for change doesn’t seem strong enough (status quo bias) or we think we knew it all along (hindsight bias). Low-growth segments of a business may look attractive when presented by a strong management team (halo effect) and the question ‘is the stock fairly valued’ may be interpreted as ‘do I like the stock’ when forming the investment case (substitution effect). These biases really matter. Overcoming them and applying systematic rules can enable significant alpha creation, from creating a ‘quality control’ check on additions to a portfolio, to applying a stop-loss when stocks underperform. First, top-line variability is consistently underestimated. Consensus revenue growth forecasts will typically start in the 5%-6% range for the market at large, but the true outcome almost always turns out to be a significantly higher or lower level. While nine of the last 10 years’ consensus revenue growth forecasts have been initially in the 5%-6% range, no year saw actual growth within that range. Analysts are reluctant to take a significant view on growth ahead of the date (conservatism, risk aversion), and/or are anchoring to economists who themselves are making the same mistake. Put another way, over the last decade analysts have typically expected 50% of companies to report sales growth in a 2%-8% range, yet only 23% have actually delivered sales within this range. Second, analysts will typically underestimate the extent of reinvestment via capex or M&A. Net debt used to fund this reinvestment has been revised upwards in seven of the last 10 years, irrespective of the market environment. This may reflect conservatism and a lack of incentive to take a view on lumpy investment. It may also reflect anchoring to company guidance, which itself is disincentivised to announce investment plans early (take a look at the consensus 2013 and 2014 deleveraging assumption. In an environment of ageing assets and rising visibility, are companies really going to buck the trend and de-lever rather than reinvest?). Third, analysts will frequently revise estimates post company results, but will less commonly revise estimates in the intervening period. As such, analysts will over-weight information presented by the company, but under-weight data on the broader market (GDP, inflation, unemployment) or the company’s position within it (pricing power, barriers to entry etc, potentially sourced via primary research). Analysts can miss out on the full picture, or the representative dataset, which can distort estimates. The demonstrable biases above are probably just the tip of the iceberg. But, each one will have a meaningful impact on long-term earnings estimates, and these will discriminate from company to company. One group of stocks standing to benefit is those with profitable growth opportunities. Company managements will rarely disclose the full extent of future capex plans (conservatism, lack of incentive) and yet their commentary can be disproportionately weighted (manifestation #3 above) and as such the extent of reinvestment and releveraging will be underestimated (manifestation #2). All this focus on estimates, but do they really matter? Can’t we just rely on average estimates but decent models? Unfortunately we can’t. Just as the conclusions of classical economic theory have been challenged, because the assumption of human rationality is unrealistic, so recommendations taken from inaccurate estimates (irrespective of models) can yield underperformance. To provide an example, buying Stoxx 600 companies on low P/E multiples (and selling high) would have generated c.25% annual alpha over the last decade using 12-month forward actual reported earnings, but would have lost c.3% per annum using consensus estimates. Interestingly, you would lose less money applying historical earnings (-2% alpha pa) than by using consensus estimates. Simply put, biases make consensus estimates worthless.